I am often amazed at what I see when I watch a marching band’s ensemble rehearsal. Usually, they will saunter out to the field with the pit pulling out everything imaginable. The band will spend some time warming up. The bigger bands do this in sections broken up by brass, woodwinds, and percussion. Then the director asks them to start in a music arc or will tell them to get into a set in the drill. But what happened to the Visual Warm Up? Would we expect distant runners to just line up before their race? Absolutely not! Then why do we expect our performers to do just that? We need to take into account what our bodies will endure as we go set to set. Yes it will take some time to do a Musical Warm Up and Visual Warm Up, but it’s well worth it. Some breathing exercises to develop air support. Some long tones in the brass to work on tone and support. Flexibility exercises for Woodwinds and Brass all over the range. All of these things can be accomplished in 10 – 15 minutes. Now is the time to work on the Visual Warm Up! Let me preface this, if you are not doing visual in the block, it’s not necessary to do a visual warm up, but not a bad idea either! Students do well with routines and you will find the 10 – 15 minutes spent a rehearsal will pay off tenfold down the road. Start with a review of proper posture and instrument placement. While this may seem elementary, your posture will affect everything else. Then move onto some 8 & 8s forward. Use this time to correct technique in younger performers. Then do this backwards. Watch for technique again, especially in their legs and feet. 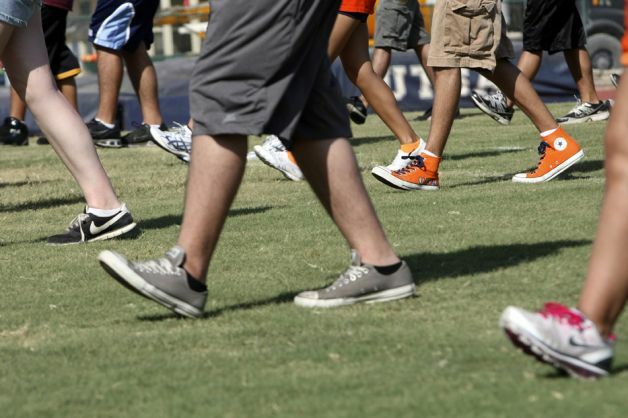 Backwards marching is one of the hardest things to master for young performers with the tendency to fall back on their heels. Now, add transitions front to back and back to front. Incorporate upper body slides and horn angles for flexibility. Finally add anything that is incorporated into the visual program like marching at a slow tempo (feet cross on the half beat) or going into different positions at halts. This sounds like a basics block, but it really is more than that. This progression of technique is something that will improve your marching band both visually and musically. After all, this is Marching Band and they need to move. No one wants to be the band that the audience can “hear the feet” as they plod along. Take time to address the visual and you will see improvement in the final product. One of the first things I want to see when I clinic a band is their basics block. I find that by watching the basics block I can predict the issues they will have on the field. Bands that excel at visual basics are impressive to watch in their block. They have an attitude in the block and it shows up in their confidence on the field. It’s also obvious that some bands never revisit their block after band camp. The Visual Warm Up is something you should also do at a show site. It’s not the newest thing around and groups have been doing it for decades, but yet there are groups that only do a visual warm up when they compete. While this seems nice, the kids are thrown for a loop when the routine changes. Help your kids out and do this at rehearsal as well. There is nothing more intimidating than a marching band that has impeccable technique in the block. So why do we neglect the Visual Warm Up? I would say that directors don’t understand the importance of it or think that there isn’t enough time. When time is an issue, have a routine of doing a visual warming up a couple of times a week instead of everyday in a short rehearsal. Full rehearsals should have 20-30 minutes of warm up. It may seem like a waste of time, but in reality you are building skills that will impact your students both on and off the field. What have you found that was effective in using the Visual Warm Up? What success have you had because of the Visual Warm Up? Share your thoughts below.